Google has an official guide for transferring data between G Suite accounts: https://support.google.com/a/answer/1041297?hl=en . Unfortunately, this process is overly complicated, and different methods must be employed for different services. For Google Drive files, it is necessary to create data migration scripts using Google APIs just to transfer the files. The complexity and sheer amount of work make this method infeasible for most G Suite organizations. The second method provided by Google is easier than the first. When deleting a user in the G Suite administration console, the following dialog will pop up, asking you to transfer the user’s data to another account. 🔺Important: STOP! DO NOT click the DELETE button! Gmail messages and Google contacts are NOT included in the data transfer. If you delete the account, all Gmail messages and contacts for this account will be lost forever! Click the CANCEL button. You need to transfer the Gmail messages first and then come back to this step. For reference, here are Google’s detailed instructions for Migrating email from one G Suite account to another. Make sure your G Suite edition supports G Suite data migration. G Suite data migration is only available for *G Suite Basic, Business, Enterprise and Education accounts. If you have the legacy free edition of G Suite, you need to upgrade to G Suite Basic to get this feature. Sign in to your Google Admin console using an G Suite administrator account. Ensure that access by a less secure app is permitted for all users. For instructions, see Enforcing access to less secure apps for all users. You should disable less secure apps once the migration is complete. Turn IMAP on for users to any accounts. If you have 2-Step Verification or Single Sign-On (SSO) enabled, you need to generate an app password for the data migration service. You’ll use it later in the Google Admin console when you are migrating mail. Click the settings icon in the top corner and select Settings. Click Forwarding and POP/IMAP, then under Folder size limits, select Do not limit the number of messages in an IMAP folder (default). Click Labels and ensure that any label that needs to be migrated has the Show in IMAP box checked. From the Migration source list, select G Suite. From the Connection protocol list, select Auto select (Recommended). Enter the role account information for your old G Suite account. This is the G Suite administrator’s email address and password. Click Connect. The data migration service attempts to detect your old G Suite account. In the Migration start date and Migration options sections, accept the default options or choose to exclude data that doesn’t need to be migrated. Point to Add icon and click Select user icon. In the Migrate From field, enter the user’s legacy email address and password. Google Drive files and folders can only be migrated when one account is being deleted. There is no way to merge two existing accounts without deleting one of them. G Suite data migration is not available for the free edition of G Suite. If you are using the legacy G Suite free edition, you need to upgrade to G Suite Basic to get this feature. G Suite resellers are not able to migrate data on behalf of their clients. Google Contacts are not included in this method; you still need to manually export the first user’s contacts and import them to the second user. The method is only available before a G Suite account is deleted. Once the account has been deleted, there is no way to transfer the lost Gmail messages and Contacts to another user. The two methods listed above are overly complicated and each have limitations which prevent most organizations from effectively using them. Fortunately, if your organization uses CubeBackup to secure your G Suite data, migrating data from one G Suite account to another is simple. 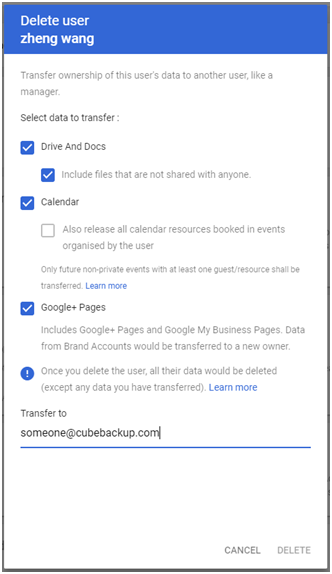 Not only does CubeBackup protect your data and allow you to restore Google Drive files, Gmail messages, Contacts, Calendar events and Google Sites files from backups, you can also merge or transfer data from one G Suite account to another at any time. Sign in to the CubeBackup web console. Click Restore in the left panel. Select User A from the user list. Transfer Gmail messages between G Suite accounts. In the Gmail panel, click the box beside All in the left column to select all messages. Then click the Restore button, and in the dialog box that pops up, select User B from the dropdown list and click Restore. Note: The All label selected above includes all messages and their labels (as well as any custom labels) except for Trash and Spam. If you wish to transfer messages in Trash and Spam, repeat this step again, selecting the Trash and Spam labels. Transfer Google Drive files between G Suite accounts. In the Drive panel, select the root folders Drive and Trash. Click the Restore button, and in the dialog box that pops up, select User B from the dropdown list and click Restore. Note: Be sure that the most recent entry in the timeline is selected, otherwise an older version of the Drive files and folders will be transferred, instead of the latest version. Transfer Google Calendar events between G Suite accounts. In the Calendar panel, select all the calendars. Click the Restore button, and in the dialog box that pops up, select User B from the dropdown list and click Restore. Note: Be sure that the most recent entry in the timeline is selected, otherwise an older version of each calendar will be transferred, instead of the latest version. Transfer Google Contacts data between G Suite accounts. In the Contacts panel, check All Contacts. Click the Restore button, and in the dialog box that pops up, select User B from the dropdown list and click Restore. Note: If you select All Contacts, there is no need to restore each contact individually, because they are all included already. Be sure that the most recent entry in the timeline is selected, otherwise an older version of each contact will be transferred, instead of the latest version. Transfer Google Sites files between G Suite accounts. In the Sites panel, select a site, then check all files in that site. Click the Restore button, and in the dialog box that pops up, select User B from the dropdown list and click Restore. If there is more than one site, repeat the above operation for each site. Note: Be sure that the most recent entry in the timeline is selected, otherwise an older version of each site file will be transferred, instead of the latest version. Data can be migrated to a new user at any time, not just when an account is being deleted. Since CubeBackup keeps backups of all data, the migration will work even if the first user has already been deleted. Works for any type of G Suite domains, even the G Suite legacy free edition. Migration features will also work for G Suite partners/resellers. All G Suite data can be migrated, including Google Contacts and Google Sites data.